I have a client who asks me to make muffins every week for her family. And, to be honest, it’s such a fun thing to do! I rarely make muffins at home because I know I will end up eating them all (I have no self control with baked goods). 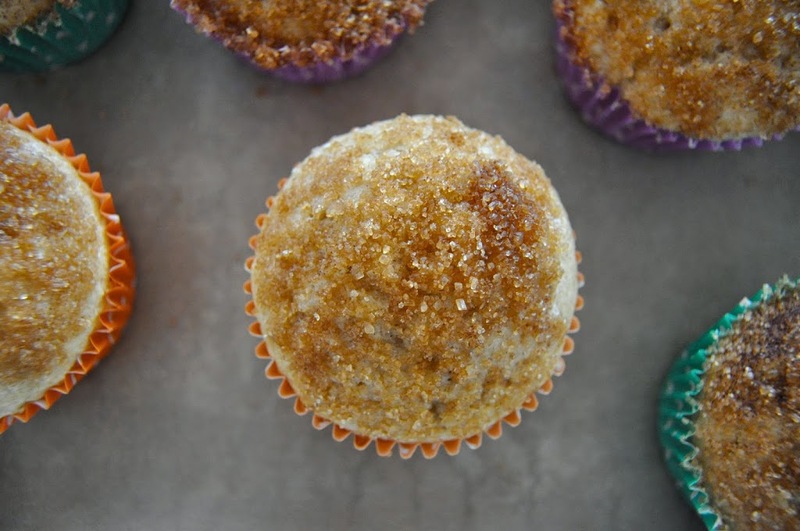 But this is a really fun way to get my baking fix, have something warm and tasty for them the afternoon I am there and most of the time I can sneak some veggies and fruit into the muffin along with some nice whole grain flours. Now, all those lovely things I just mentioned above don’t really apply to these muffins. These are just good old buttery morning muffins. They will fill your kitchen with a glorious whiff of cinnamon and just baked goodness and will also satisfy that doughnut craving. They remind me of the simple muffins I used to make when I was younger. Flour-sugar-milk-some sort of filler (fruit, chocolate, etc.). Easy to put together and not enormous in size, because really, who needs to eat a pound sized muffin?? Now, I’m pretty sure you probably have most of these things in your pantry, so why not plan to make a batch of these over the weekend and make your loved ones happy? That is, unless you are like me, and have a tendency to eat them all first! 1. Preheat oven to 350. Line a muffin tin with paper liners and set aside. 2. In a medium bowl whisk together the gluten free flour blend, guar or xanthan gum, baking powder, sea salt and cinnamon. 3. In another bowl whisk together the melted butter or coconut oil, coconut sugar and then add in the large eggs. 4. Add the flour into the dry ingredients to gently blend and then add the buttermilk to mix it all together. Stir with a whisk until the batter is all incorporated, about 20-30 seconds. 5. Scoop in to the muffin tins and bake for 14-18 minutes until lightly golden. 6. Mix together the sugar and cinnamon in a small bowl. 7. Remove from the oven and let cool for about 10 minutes then, carefully, remove the muffins from the tin and dip the top in the melted butter-allowing the extra to drip off-and then roll in the sugar cinnamon mixture. Set aside to dry and continue with remaining muffins. *To make egg free simply substitute 2 flax eggs (2 T. flax meal + 1/3 c. hot water) for the 2 regular eggs. **To make dairy free buttermilk mix together 3/4 c. favorite dairy free milk and add 1/2 t. apple cider vinegar. ~Cherry Coffeecake Muffins : Add some dried cherries to the batter for a cherry coffeecake muffin. Once cooled, drizzle with a mixture of powdered sugar + milk + sprinkle of toasted pumpkin seeds. ~Blueberry Buttermilk Muffins: Keep muffin recipe as directed except add 1 cup frozen wild blueberries (they are smaller and blend easier in muffins). 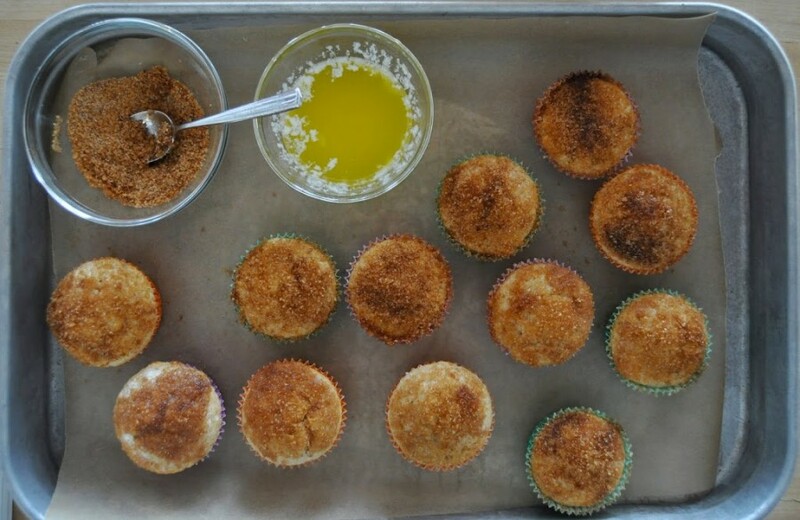 Once baked, allow muffins to cool and then drizzle with a mixture of powdered sugar + buttermilk.